A cobbled lane in York which dates from the Middle Ages has been voted Britain's most picturesque street. 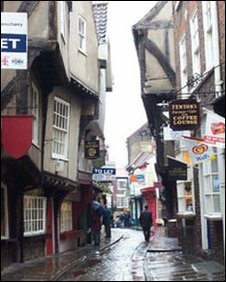 Shambles, which is lined with 15th Century buildings, took the prize in the Google Street View Awards. The Royal Crescent in Bath and Grey Street in Newcastle came second and third respectively in the vote. Hampshire's Stockbridge High Street was voted "best foodie street" and Milsom Street, in Bath, "best fashion street". More than 11,000 people voted. They voted for their favourites after five streets were shortlisted in each category by a panel of experts, including travel editors. Ian Addyman, who owns a shop on Shambles, said it was full of "historic charm". He said: "There is a real feeling of community amongst shop owners and I think we all feel privileged to work in such a beautiful place. The shops here are all strikingly different and unique. "Most people say that if you visit York, then at some point you will walk down the Shambles. "It has been the backdrop for many a jigsaw, chocolate box and railway poster and once you visit you will see why." The buildings on Milsom Street in Bath were originally grand town houses, but most are now used as shops, offices and banks. Stockbridge High Street was praised for its independent specialist shops, tea rooms, pubs and restaurants, many of which serve local produce. Do you live in a particularly picturesque street or area? If you have photos of the scene, we'd love to see them. Please send your pictures and video to yourpics@bbc.co.uk or text them to 61124. If you're outside the UK, text them to +44 7725 100 100. If you have a large file you can upload here.